2012 marks the Diamond Jubilee of Queen Elizabeth II (Elizabeth Alexandra Mary), Having reigned for the past 60 years, she took the throne on the 6th of February 1952, although the coronation took place the 2nd of June 1953. She is the second British monarch who will celebrate such a big event. The other monarch was Queen Victoria (1897). For this year’s celebrations the Queen and her husband Prince Philip (Duke of Edinburgh), the famous royal couple Prince William and Kate Middleton and other members of the royal family have been touring England, Scotland, Northern Ireland, Wales as well as other overseas regions. Bank and school holidays have also been set to mark this grand event. Many pageants, fundraisers and lunches have also been organized to support it. A few days ago, the Queen along with the Duke of Edinburgh visited the Manchester Town Hall. 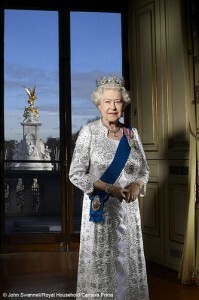 As part of the Diamond Jubilee celebrations, they attended a lunch hosted by the Lord Mayor. There were many well-wishers who came just to catch a glimpse of her. They patriotically stood outside the town hall, cheering and waving as the monarchs waved at them. Here the pink clad Queen met the newly-wed Cannings from Prestwich. The Queen and her husband became surprise guests of honor during their wedding. The monarchs even posed for photos with the couple who decided to set their wedding in spite of the scheduled Jubilee events. They were aware of the celebrations but they booked the venue before the visit was announced.